Blogger "Rosa Rubicondior" whose real name is Esther Harrison recently published a post conflating psychosis with miracles and Catholic visionaries. 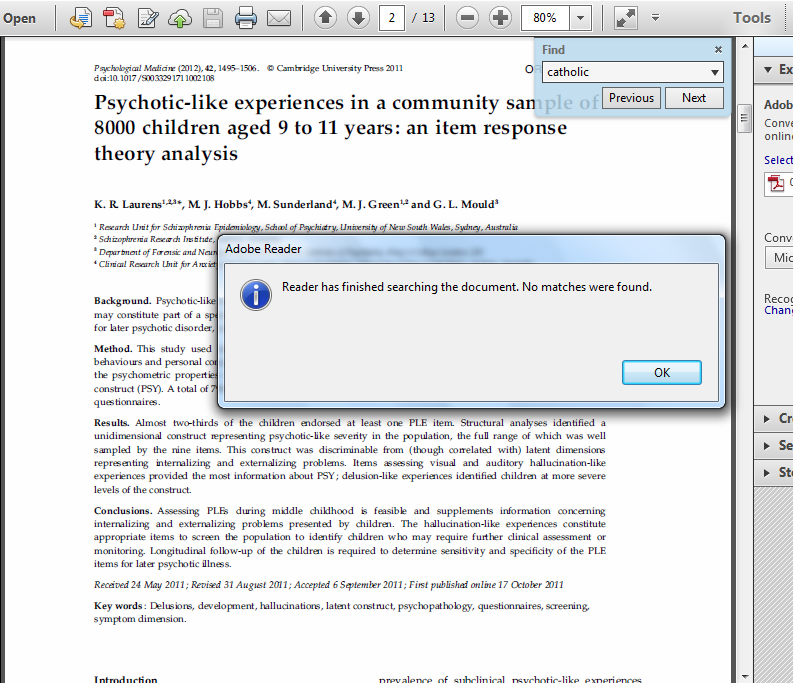 She attempts to use the journal article, "Psychotic-like experiences in a community sample of 8000 children aged 9 to 11 years: an item response theory analysis" to support her case. However, in doing so she has shown her complete ignorance regarding psychology and the Catholic religion. Esther's original words will be in quotations """". My response will be centered. "Psychological Medicine - Psychotic-like experiences in a community sample of 8000 children aged 9 to 11 years: an item response theory analysis - Cambridge Journals Online It seems that hallucinations are far more common in children that was previously thought, and in fact are fairly frequent. In one 2011 study of nearly 8000 children, two-thirds were found to have had at least one psychotic-like experience (PLE) which was more than a simple childhood play fantasy. Do we have here a simple, and above all natural, explanation for many of the supposed miracles, very often involving young girls, of visions of, in Catholic countries, the Virgin Mary?" The Apparition at La Salette, France Mary appeared to two children, Maximin Giraud, aged 11, and Mélanie Calvat, aged 14, in 1846, one afternoon while they were looking after the animals high up on the mountain. She appealed for penance and an end to Sabbath breaking and blasphemy in the region. This apparition is credited with a major revival of Catholicism in the area. The Apparitions at Lourdes, France Mary appeared to Bernadette Soubirous, aged 14, a total of eighteen times at Lourdes in southern France, at the Grotto of Massabielle. She asked for penance and prayer for the conversion of sinners, and described herself as the "the Immaculate Conception." Lourdes is most famous for the miraculous spring which has been responsible for many cures accepted by the Church. The Apparition at Pontmain, France Mary appeared in the sky over the small town of Pontmain in north-western France to a group of young children for about three hours in January 1871, as the Franco-Prussian war was threatening the area. Her message appeared on a banner under her feet, and encouraged prayer while emphasising Jesus' love and concern. The village was spared invasion. The Apparitions at Fatima, Portugal Three children, Lucia de Santos, aged 10, and her two cousins, Francisco Marto, aged 9, and Jacinta Marto, aged 7, saw Mary six times between May and October 1917. She described herself as "Our Lady of the Rosary," while urging prayer, and particularly the rosary, as well as penance for the conversion of sinners, and the consecration of Russia to her Immaculate Heart. The Apparitions at Beauraing, Belgium Mary appeared thirty-three times to a group of children in the winter of 1932-33 at Beauraing in Belgium, in a convent garden near a hawthorn tree. She described herself as "the Immaculate Virgin" and "Mother of God, Queen of Heaven," while calling for prayer for the conversion of sinners. "One of the arguments for, for example, Bernadette Soubirous of Lourdes and Lúcia Santos of Fatima experiencing more than a simple childhood fantasy was the tenacity with which they stuck to their story when questioned, (although Bernadette Soubirous' memory of the event seems to improve with age). So, could these children have had a PLE?" Esther describes the experiences of both Bernadette Soubirous and Lucia Santos as "childhood fantasy," but fails to support this claim. She fails to acknowledge that the events surrounding these two individuals are heavily documented. Many have witnessed the miraculous events in which both Bernadette and Lucia were a part of. This includes and is not limited to, healing, prayers answered, sensual perception that defies the laws of physics and so forth. Esther then asks the question, "could these children have had a PLE (Psychotic-like Experience)? The answer is no. It is normal for children to fantasize and use their imagination. The article's abstract describes this as, "constitut[ing] part of a spectrum of normative development." Those who have studied child psychology as I have are familiar with the term "animism" which comes from psychologist Jean Piaget who formulated his "Stages of Development" which rivaled that of atheist Sigmund Freud and is considered more scientific and accurate than the latter's contribution. During the Pre-operational Stage, children begin to use semiotic function, or the ability to use symbols which are assigned to actions or tangible objects cognitively. This brings about "Egocentrism" or the child dwelling within him/herself, especially during play. They tend to create a world within themselves and get lost in it. This is often characteristic of young girls playing "tea time" or boys making explosive sounds with their mouths as they play with toy soldiers and the like. This is completely normal. However, this is unrelated to Catholic-approved visions by children. 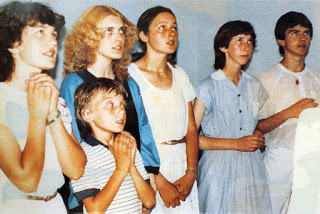 "The same case can be made for the Medjugorje 'miracle' of 1981 in Bosnia-Herzegovina in what looks remarkably like a re-run of Fatim, where the main instigators were a sixteen year-old girl, Mirjana Dragicevic and fifteen year-old Ivanka Ivanković and where, once again, the Catholic Church had a very strong political motive for wanting a 'miracle' to keep control as the political situaltion deteriorated as former Jugoslavia degenerated into inter-religious civil war, anarchy and eventually disintegrtion, following the dath of Tito a year earlier." If you have paid attention to my previous critique of Esther's claims, you will notice something stand out. Esther uses the alleged visionaries Ivanka and Mirjana from Bosnia as examples. These two individuals claim to have had apparitions of the Blessed Virgin Mary in the 1980s and I believe into the present. These apparitions are known as the "Medjugorje" apparitions. If you notice what Esther wrote, you will see that she gives their ages which are sixteen and fifteen. The problem here is that these two individuals had already passed the pre-operational stage as described by Piaget when the alleged apparitions begain in the 1980s. Ergo, they would not exhibit animism or resort to semiotic functioning. Moreover, this apparition is NOT approved by the Catholic Church. As a matter of fact, rumor has it that the Vatican will be deciding on it soon, see: http://www.catholicherald.co.uk/news/2015/06/08/vatican-ready-to-announce-decision-on-medjugorje-says-pope-francis/ Once again, Esther is showing her ignorance of Catholicism and Psychology. "In all these cases these 'visions' were then elevated to the status of miracles by first the local Catholic Church, then, when it realised the potential, the Vatican itself, and in all cases with a clear political motive and now a financial one, but what we probably have is essentially a childhood PLE, nothing more and nothing less. Other supposed 'miracles' usually associated with the appearance of figures, normally Mary, to children, usually young girls, several of whom appear to have had a troubled childhood, include:"
1) She has to remain faithful to the teachings of Christ. 2) She cannot turn into a superstition business. 3) Any discovery of fraud or true psychosis will effect the credibility of the Church. "The Church needs to put aside it's own greed and avarice for once and start recognising the fact that these hallucinations could be a symptom of psychological, even neurophysiological disorders requiring medical attention, in the interests of the children involved, rather than seizing on these possible, even probable, examples of psychotic episodes, as miracles and using them to enhance the Catholic Church's income and influence, and often effectively taking over the lives of children who then get caught up in their own legend and tied to a treadmill they can never get off. But without these fake supernatural events to fool the masses with, what would the Catholic Church have to promote it's evidence-free superstition and dogma with?" Moreover, the apparition of Our Lady of Lourdes witnessed by Bernadette was also documented extensively. Miracles that take place today are also studied and investigated by the Lourdes International Medical Committee which is an organization with a board of skeptics, scientists, medical doctors and clergy. Esther's claim that the Church uses miracles to promote its dogma is unfounded and based on her ignorance. She is clearly not well read on this topic and many others as well. 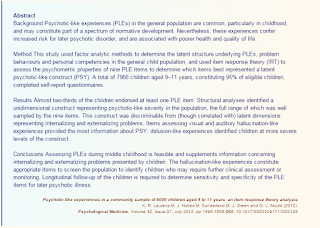 It is interesting to note that not once does Esther cite from the "Psychotic-like experiences in a community sample of 8000 children aged 9 to 11 years: an item response theory analysis" to support her case. She simply posts the link and abstract in order to deceive her readers into thinking her post is well researched and supported by the article. As a student and graduate of the sciences, I have access to numerous articles and journals. It is obvious that Esther did not have full access to the article. However, I do. Neither 'religion' nor 'visionaries' are mentioned in this article, nor are they variables. 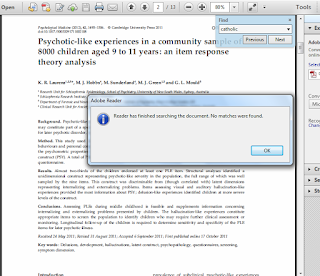 Esther simply used a journal article she did not read and attempted to conflate it with her uneducated inferences. As you can see above, the introduction clearly states the factors that lead to hallucinations and schizophrenia. Notice that religion, apparitions, Catholicism etc are not listed. The claims from Esther are unfounded and shows her dishonesty. The method of the study was as follows: children ages 9-11 were taken as subjects from 73 elementary schools in the Greater London area. An n sample of 7966 children were used with 49% of them being female. They were taken from both state and religious schools based on enrollment size. According to the statistics, the mu of the sample size was 10 years and 5 months while the standard deviation was 9. 96% of the children sampled were between 9 and 11 years old. The students were asked the following questions below. The chart shows the descriptive statistics found based on responses. Please take note that none of the questions asked by the researchers were about apparitions of God, Mary or anyone else related to Catholicism. The questions are geared around the typical symptoms of schizophrenia and hallucinations. The correlation Esther tries to make in her post is based on her science illiteracy. The APA (American Psychological Association) has clearly stated in the DSM (Diagnostic and Statistical Manual of Mental Disorders) that religion has nothing to do with delusions, psychosis and the like. 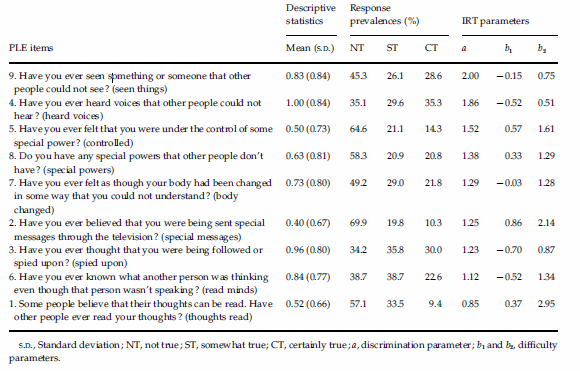 According to the paper entitled, "Differentiating psychosis and faith: the role of social norms and religious fundamentalism," it states that "Catholic beliefs were rated as significantly less delusional than Mormon beliefs.." When compared to the Nation of Islam, the researchers found, "catholic beliefs as the least delusional and with Nation of Islam beliefs as highlydelusional." 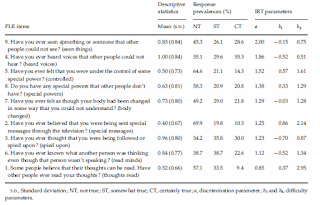 This paper relied on the typicality of delusional beliefs and how they relate to religion. Delusional beliefs that are deemed as a psychological disorder are often irrational, pervasive, cause preoccupation and can lead to severe self-mutilation (Applebaum, Robbins, & Roth, 1999; Siddle et al., 2002; Culliford, 1987; Waugh, 1986). 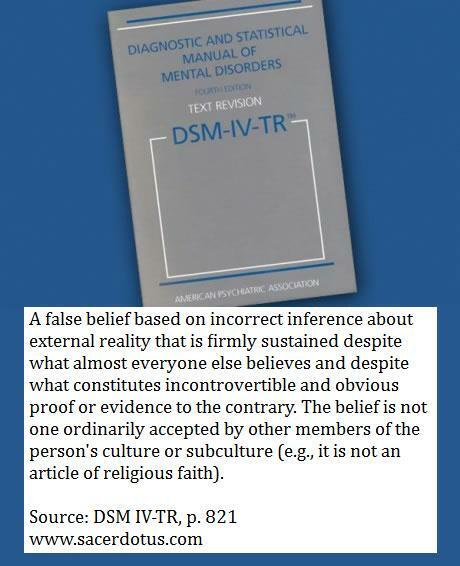 There are several other studies and research papers available which clearly disqualify religious beliefs as delusional based on the typicality and prevalence of symptoms, many times comorbid with other conditions. Esther's attempt to conflate the article studying children and testing for "PLE" with Catholic visionaries is poor scholarship and a pathetic attempt at reason and scientific inquiry. As demonstrated, Esther's intent was to deceive her readers into thinking that the article she linked supports her warped inferences and conclusions. The latter are simply based on her atheistic cognitive bias which fails to see evidence and scientific research that contradicts her irrational ideas and conclusions. Those apparitions that are approved by the Church passed that bar because they met the criteria. The Church employs ever effort and asset against any claims of the supernatural. This includes the use of the scientific method, skepticism, scientific professionals, theologians and the like. In many cases, it takes the Church nearly centuries to decide on an alleged miracle or apparition. There is no psychosis or fraud involved in Catholic Church approved apparitions. In reality, the real psychosis is demonstrated in Esther's post vis a vis her conclusions. 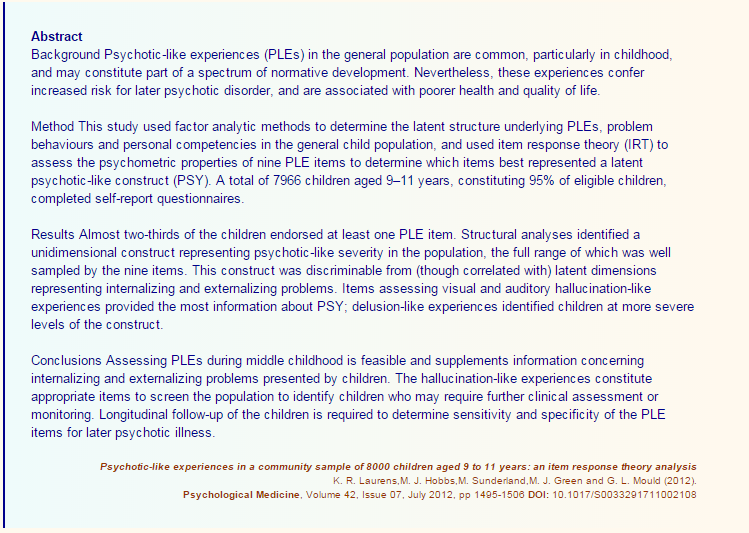 The fraud here is her attempt to pass off her inferences and ignorance as scientific and supported by the article, "Psychotic-like experiences in a community sample of 8000 children aged 9 to 11 years: an item response theory analysis." This post on my blog exposes her ignorance and bias. If you wish to have the article Esther links in her post, a fee of $30 USD must be paid here: http://www.sacerdotus.com/p/donate-to-ministry.html . Use the paypal button and be sure to write on paypal's check layout the name of the article. Child Animism: What the Child Means by "Alive" S. W. Klingensmith Child Development. Vol. 24, No. 1 (Mar., 1953), pp. 51-61 Borke, H. (1975).